Swimming pool maintenance involves very simple and logical processes, that when followed consistently, will result in crystal clear water all year round. There are a few common mistakes that even the most diligent pool owner will make from time to time so we thought we would lay them out for you to print and post on your refrigerator as a reminder. 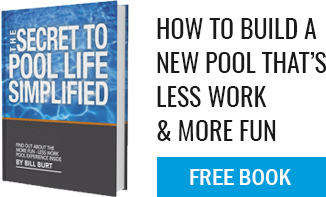 With most pool systems operating on timers, this one is fairly easy to get right but many pool owners are not even aware of the guidelines around run time. It is recommended that you run your pump for 8 hours each day or enough time to turn over your water twice. This can vary depending on the size of your pool and speed of your pump so check with a pool expert when trying to figure out the correct schedule. Run time is critical to maintaining an effective filtration system. Taking a water sample up to your local pool supply store a couple of times a month is incredibly important because it keeps you up to date on your pool chemical levels, particularly your pH levels. Water testing is often one of those tasks that ends up getting ignored and when it comes to pH levels, acidic water can cause real problems for your equipment and surface material. If you can’t make it to the supply store often enough, consider buying one of those simple home testing kits and add another pool maintenance skill to your tool belt. In addition to regular chlorination, pools require periodic shocking in order to break up the chloramines formed by bacteria and other substances bonding with free chlorine. While the basic principle of shocking is to add a super dose of a sanitizing agent to the pool, it is best to do this in the evening as chlorine will actually evaporate fairly quickly when exposed to the sun. There are undoubtedly other common mistakes being made from time to time and we do not want to call them all out at once. Remember these common malpractices and stay on top of your maintenance program because there is really nothing like coming home to a beautifully clean and clear pool each and every day.